Accepting the validity of the racial view, it becomes clear that the attributes and status of marginal communities are essentially functions of their physical and social environment, and not of Divine displeasure or some mysterious incompatibility of 'blood,' a fluid which has nothing to do with informed social discussion. Certainly, there are disharmonic and socially maladjusted individuals in such communities. Perhaps, too, their incidence is higher than it is among more integrated groups, though that remains to be proved, but they are susceptible to the same methods of improvement that are applied to 'pure' peoples. I subscribe without qualification to the prevention of undeniably dysgenic matings, whether exogamous or endogamous, but not to the conceit that colour and economic success are indices of desirability. Cedric Dover. Half-Caste. London, 1937. Secker & Warburg. 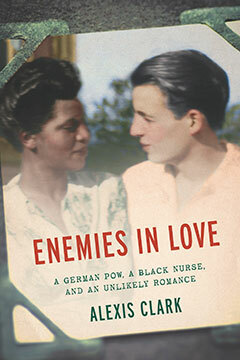 This is a love story like no other: Elinor Powell was an African American nurse in the U.S. military during World War II; Frederick Albert was a soldier in Hitler’s army, captured by the Allies and shipped to a prisoner-of-war camp in the Arizona desert. Like most other black nurses, Elinor pulled a second-class assignment, in a dusty, sun-baked—and segregated—Western town. The army figured that the risk of fraternization between black nurses and white German POWs was almost nil. Brought together by unlikely circumstances in a racist world, Elinor and Frederick should have been bitter enemies; but instead, at the height of World War II, they fell in love. Their dramatic story was unearthed by journalist Alexis Clark, who through years of interviews and historical research has pieced together an astounding narrative of race and true love in the cauldron of war. Based on a New York Times story by Clark that drew national attention, Enemies in Love paints a tableau of dreams deferred and of love struggling to survive, twenty-five years before the Supreme Court’s Loving decision legalizing mixed-race marriage—revealing the surprising possibilities for human connection during one of history’s most violent conflicts. This entry was posted	on Sunday, February 10th, 2019 at 22:57Z	and is filed under Biography, Books, Europe, History, Media Archive, Monographs, United States. You can follow any responses to this entry through the RSS 2.0 feed. Both comments and pings are currently closed.